Assessing your service population is the first step towards developing programming. This requires that your organization determine the needs of your population and the support resources already in place. 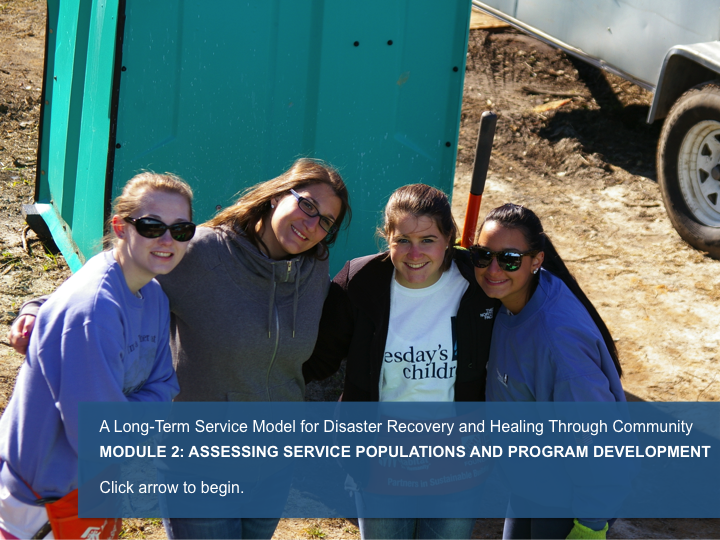 Module 2 provides "Roadmap Charting" to help you uncover, understand and address your service population's needs and resources. Where a page contains “Roadmap Charting”, click SUBMIT to save your information before moving to the next page. 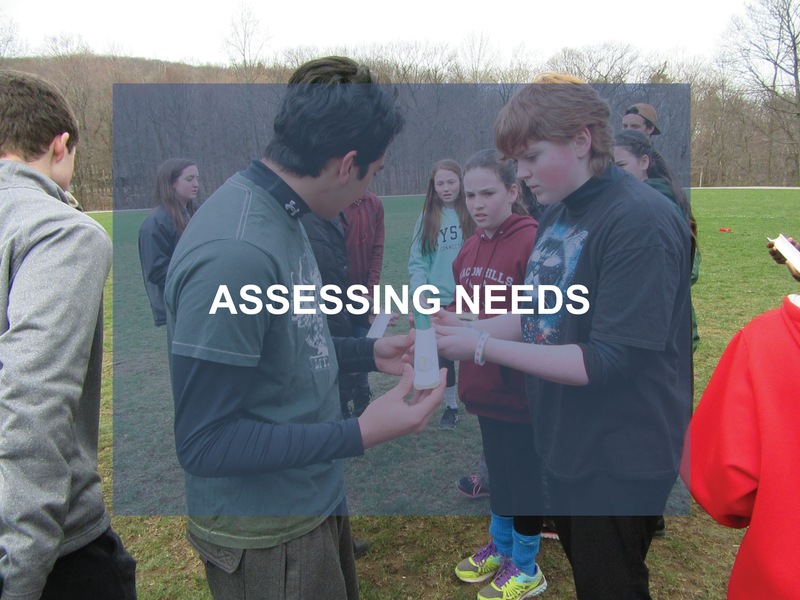 Involving community members in the initial stages of the assessment process is important because it demonstrates both trust in the process as well as community buy-in and support, not only of the assessment, but whatever actions are taken as a result of it. Tuesday’s Children has been able to engage difficult to reach populations largely because our engagement approach focuses on initially building trust, continually assessing needs and creating a nurturing community, which is important for anyone seeking to provide long-term support after a tragedy. 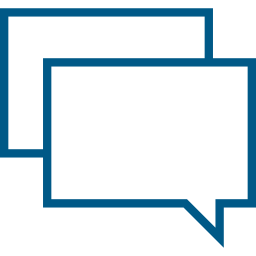 Community engagement will vary for each community and population, however, there are certain common themes when responding to traumatized and bereaved groups, particularly those impacted by terrorism. Tuesday’s Children engaged in a three-fold approach when building bridges to families and creating positive experiences through their common bonds. Click on each approach for more information. Partnering with health and human service providers, government officials, influential people, community activists and businesses can be helpful with knowledge sharing, community change effort and influence. This allows for the construction of a network of supportive families who, together, can meet the long-term needs of those coping with loss and trauma. This reduces the stigma of seeking support services for families left traumatized and bereaved. Research has shown that traumatized families and communities impacted by terrorism are generally reluctant to seek traditional support services. Community-based approaches, like ours, have the most success. Registering constituents and collecting demographic data was an important first step for Tuesday’s Children in conducting outreach. This developed into a consistent record-keeping system that ensured the ongoing needs of our population were being met. In the early aftermath of September 11, Tuesday’s Children’s two-person staff conducted research and used family-focused engagement events (like recreational picnics) as first points of contact to register constituents. 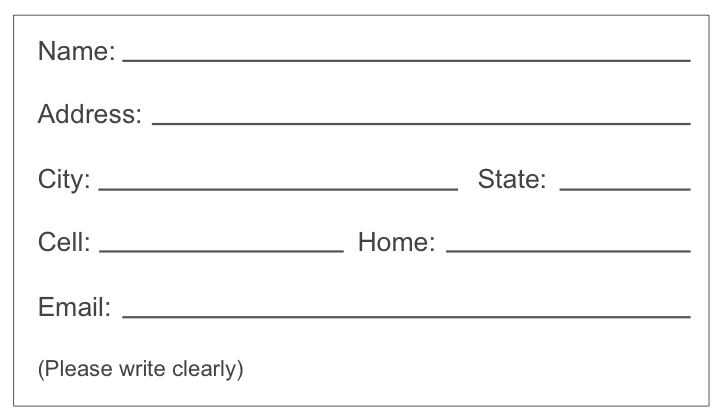 Registration forms were organized and categorized to build a firm base of support and assess community needs—this method ensured consistent records and helped meet ongoing needs. Today, technology can be leveraged to collect data with online registration forms, social media platforms, blog posts with calls for action, online surveys and more. Depending on the nature of your work and the type of outreach you think is needed, consider the following steps as you begin or expand your outreach. Click on each step below for more information. Determine the purpose and appropriate methods of outreach. Have you determined who your users are (or should be)? Do you know what the best ways are to reach and serve your users? Have you identified any gaps in use of your program or service? Whether your staff is paid or volunteer, they must be well-trained and knowledgeable. It helps if they come from the community they work in and are familiar with its characteristics. Staff can play a vital role in developing community trust and a good reputation. Workers who live in the community they serve will understand the needs, concerns, and questions of the people they serve, and understand the barriers they face. 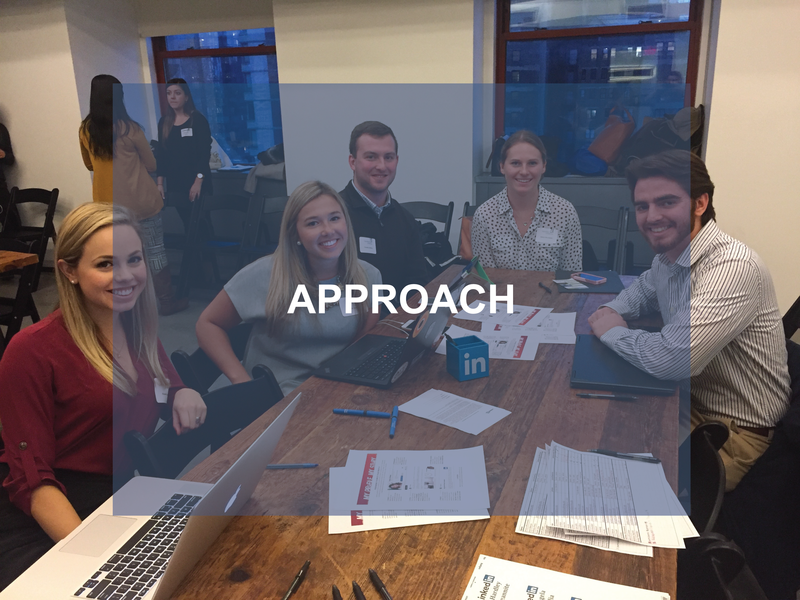 There are many possible avenues for outreach, so it is crucial to develop a prioritized strategy for raising awareness. Start with activities that are easier and most comfortable and move toward less familiar and more challenging ones. Make the most of your outreach. It is important to understand the issues of access and barriers to access for your population—inefficient outreach doesn't reach the desired individuals or group. Outreach needs to be varied and constant since people need to hear about something three to seven times before they act. Outreach can be the foundation of an effort to meeting the needs of your community. Start by establishing a foundation of trust. Registering constituents and collecting demographic data is an important first step in conducting outreach. One size does not fit all when it comes to outreach. Repeated touchpoints increase awareness and visibility. The better you know your community, the more effective your outreach will be. The typical nonprofit is built around programs, which are developed to carry out the organization’s mission, strategic planning goals and needs of the community. 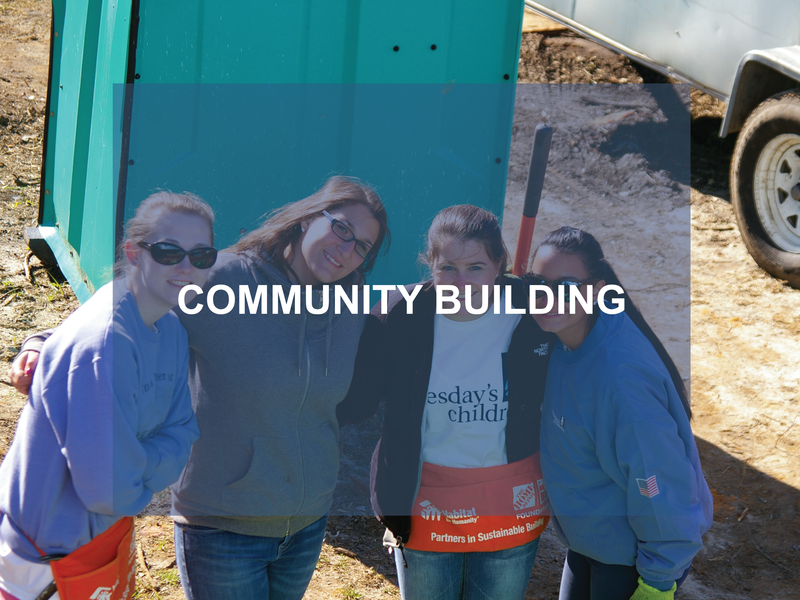 Click on each item below to learn about the progression of our community engagement model and how it integrates with our program development. This builds community through family-focused events. These events establish trust, identify ongoing needs and facilitate outreach for specific programs. An early identified need for Tuesday’s Children was to assist families coping with chaos and busy schedules with wellness, life management and skills development programs and workshops. In early years, Tuesday’s Children provided referrals to a network of mental health services. In later years, in-house counseling was implemented and psychosocial components were integrated in all programs and services. Through our initial programs — fun, family-focused events — Tuesday's Children was able to create trust, register individuals, identify the early needs of the families we were working with and create targeted programming. Early programs included wellness programs, skill development workshops, parenting workshops and bereavement support. The need to build trust through engagement events is imperative. Those impacted by tragedies often do not seek out mental health services in the immediate aftermath of a tragedy due to the fact they are immersed in what Jacob D. Lindy, MD, calls the "trauma membrane" — a protective, normal response to a traumatic event. While some agencies may need to have a clinician on staff to immediately provide crisis counseling and mental health services, Tuesday’s Children was fortunate to have a network of providers through the Mental Health Association, the American Red Cross, NYU Child Study Center, Good Grief and other partners, and benefits were available to family members immediately impacted. In later years, when these mental health services were unavailable, we moved counseling in-house. Notably, 9/11 happened in New York City, where it is almost a stereotype that everyone has a therapist. It is a global center for therapists and mental health supports. Other communities that can benefit from the Model might not have access to such comprehensive mental health resources (e.g., rural and less densely populated areas, or cultures that may not rate mental health counseling as a needed support). 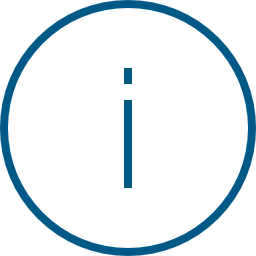 Where external mental health resources are unavailable, we recommend having a mental health clinician on staff for immediate support. 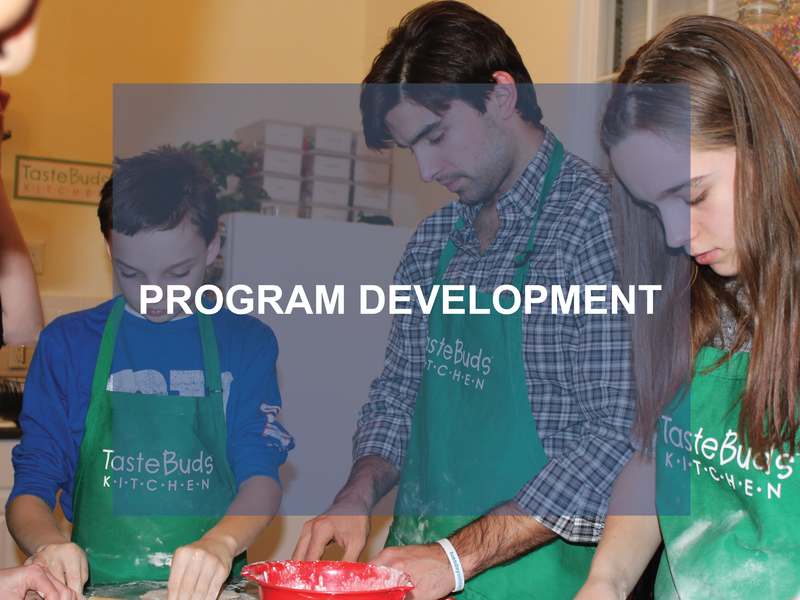 Click on each button below to see how our programs have evolved since our formation. What are the most pressing immediate and longer-term needs of your community? 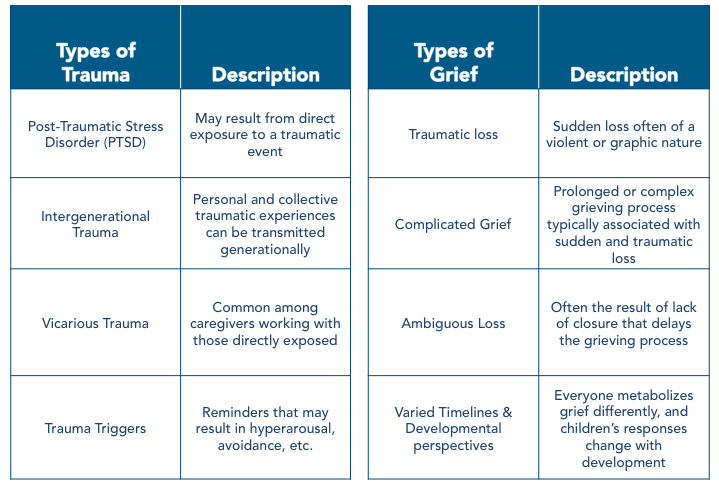 Understanding the interplay of trauma and grief in the populations you serve is critical when developing programs to help alleviate emotional reactions and symptoms. Click on each button below to understand each emotional state. 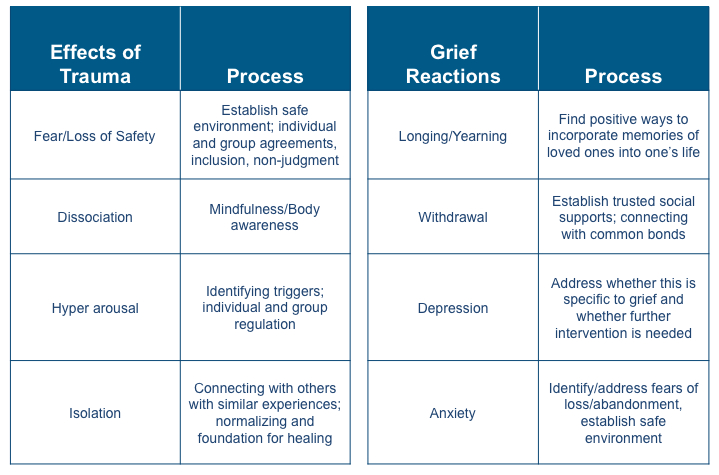 Responses to trauma and grief vary significantly based on a person’s individual prior experience to the event. Trauma doesn’t define itself by the event but it’s cumulative impact in a person’s life. We observed a wide range of reactions to 9/11, and clinicians working with families had to be very responsive not only to the acute trauma of 9/11 but also previous traumas. Many people across the country exhibited trauma even if they did not experience it in person. Children seeing it play over and over again were triggered and retriggered. Ambiguous loss is something we have seen a great deal of since 40% of 9/11 families received no remains, which has prolonged the grieving process for many family members. In both trauma and grief we see instances of isolation and withdrawal. Tuesday’s Children has been particularly good in addressing this by creating connections for people who have had similar experiences. This has been a foundation for healing and has helped to normalize these experiences and create significant trust within our community. On the following pages, we will explore in-depth the origins and impact of Tuesday’s Children’s signature programs, including programs that can be adapted and replicated. Many of our signature programs are evidence-based and have proven outcomes in supporting those impacted by traumatic loss. Click to the next page to begin learning more about Tuesday’s Children’s signature programs. Engagement and Outreach programming has been a cornerstone of Tuesday’s Children’s outreach efforts for the past 15 years. It has built trust and has helped families stay connected with one another, while allowing Tuesday’s Children to be receptive to the needs of its service population. It provides healing on a continuum by maintaining contact with families and engaging people at different stages of their non-linear experience. Events are offered to all service populations and help to connect families to a nurturing community of healing. The Mental Health and Wellness program is the underpinning of many of our other programs. Mental Health and Wellness services include individual and family counseling, keynote talks and seminars, and holistic support to address trauma and grief symptoms and improve family dynamics. To provide supportive and therapeutic services to children and families impacted by terrorism and traumatic loss. To create bridges between mental health and wellness programs. Youth Mentoring is one of our longest running programs and has served 200+ children. Our average match exceeds 2.5 years with some reaching 10+ years. Youth Mentoring is currently expanding to accommodate the growing number of Military Families of the Fallen. Tuesday’s Children’s Career Resource Center includes career and college prep services, career shadow days, leadership development, workshops, networking events and our annual Take Our Children to Work Day. In response to the proliferation of global terrorism, Tuesday’s Children created Project COMMON BOND in 2008 as an opportunity for 9/11 teens to unite with others from around the world who share similar loss. Tuesday’s Children created Project COMMON BOND as an international peacebuilding program which brings together young adults who have lost a family member to an act of terrorism, violent extremism or war. Project COMMON BOND has united international youth impacted by terrorism to engage in dignity-focused activities, learn about peacebuilding and form lasting friendships. 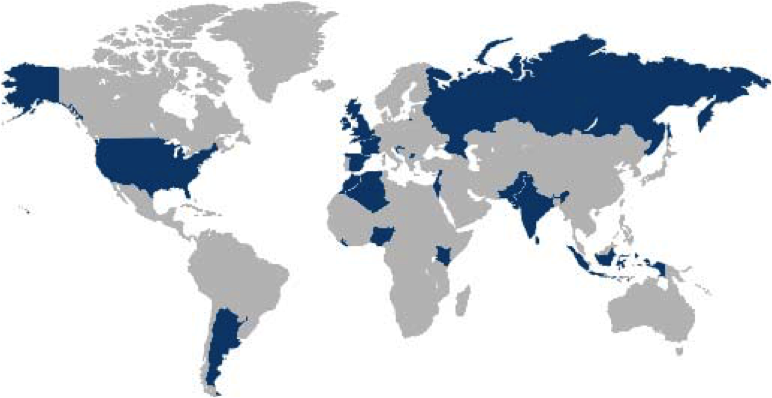 As shown on the map, Project COMMON BOND has built a truly global community with more than 550 participants in our summer program from 25 different countries. The newest expansion of the program is a new winter session for alumni of our summer program, which began in January 2016. This session focuses more directly on building concrete skills in conflict negotiation, resolution and peacebuilding, and introducing participants to the possible career paths in those fields. Helping Heals connects youth and families impacted by 9/11 with community service-learning projects, disaster relief programs, and international and domestic volunteerism. Skills Development programming addresses the mental health and life issues faced by families dealing with a traumatic loss and provides valuable tools and life management skills. 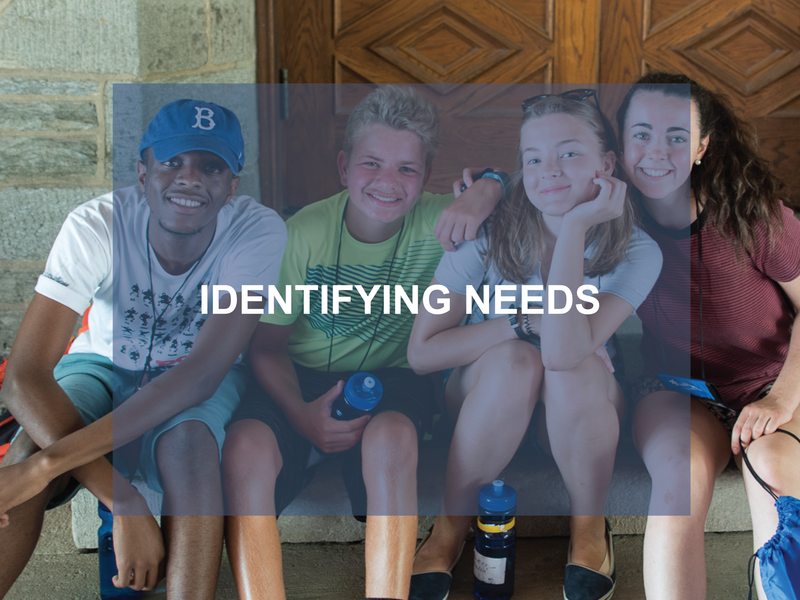 Programs like Creative Insight, Project Heart to Heart and facilitated skill building trips for teenagers and families allow for participants to develop skills for challenging life situations. Creative Insight is a program that was brought to us by a 9/11 family member who had taken renowned Stanford University Graduate School of Business course, Creativity in Business, and felt it could be adapted to traumatized and bereaved populations. Tuesday’s Children has replicated Creative Insight in multiple settings including serving 500+ people in the 9/11 community, in Newtown, CT, and U.S. Military widows. Project Heart to Heart is a three-day retreat that brings together 9/11 Widows and U.S. Military Widows, providing a peer support network that helps them to grow, heal and form lifelong friendship. Beginning in 2017, Project Heart to Heart will be open to parents who lost a child in the military. Eventually you will want to determine if it is pertinent for you to expand services or replicate. You may not want to focus on expanding services now so it is important to know your organization’s limits. Expansion is a longer-term step and your organization needs to be established and mature in order to consider this. Think of the long-term, but be sure you can accomplish what you set out to do now and do it effectively. 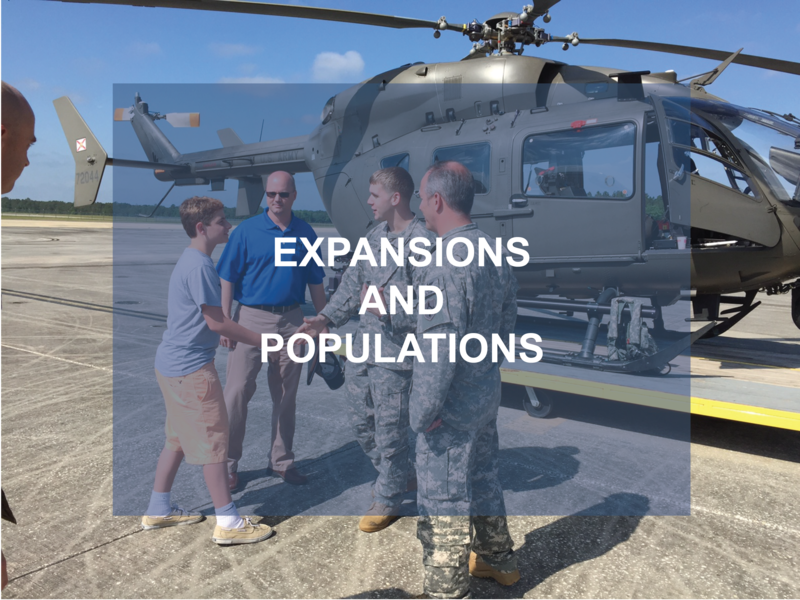 Click on the timeline below to view examples of Tuesday's Children’ expansions and populations served. 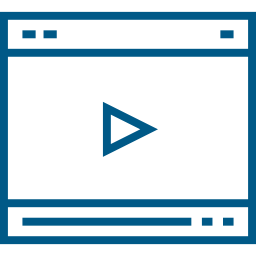 You have completed Module 2: Assessing Service Population and Program Development. You are now ready to address your community’s needs to develop programs. To begin, click “Access your roadmap”.